It’s no real secret that many Russians have a positive impression of Stalin; it was 49% in February 2013, insignificantly down from 53% in 2003. (This is not a view that I share). There are probably a few big reasons for this: (1) The mistaken notion that without him Russia would have remained in the age of plows, not rockets; (2) The relatively low corruption and perceived social justice in that time; (3) His role in securing victory in WW2, the latter of which carried away far, far more Russian lives than Stalinist repressions; (4) Last but not least, the liberal-promoted defamation of Stalin and associated efforts to equalize the Soviet Union with Nazi Germany; this is deeply repugnant to the majority of Russians – especially as while the majority did have someone die or go MIA in their families during 1941-45, many fewer had relatives sent to the Gulag for political crimes let alone shot – and as such there was a regrettable but entirely understandable angry reaction to such slanders in the 2000s. 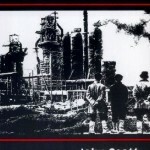 What it is almost certainly not, however, is part and parcel of some “neo-Soviet revanchism” that seeks to forcibly reincorporate former territories into Russia (Russian nationalism today is primarily of the contemporary European kind that seeks to limit immigration in its moderate form, and expel ethnic minorities in its radical form). It’s certainly not because of some Putin imposed blackout on discussions of Stalin’s crimes; only retards who read neocon media would believe that. Nor is it something that is specific to Russians and the long-abused meme of their “yearning for a strong hand“. Because according to Levada polls, pro-Stalin sentiment in “democratic Georgia” is actually substantially higher than in Russia. The table above shows the sum of positive emotions (adulation, respect, sympathy), negative emotions (dislike, fear, repugnance, hatred), and indifferent emotions (don’t know who was Stalin – 1% in Russia, 4% in Georgia, a remarkable 20% in Azerbaijan, refuse to answer) towards Stalin. Georgians have by far the most positive opinions towards him in net terms, and are also the least indifferent to him; while pro-Stalinists slightly outnumber anti-Stalinists in Russia, it also has the highest percentage of people who are indifferent to him. “Stalin was a wise leader, who brought the USSR to greatness and prosperity” – 47% of Russians agree, 38% disagree; 69% of Georgians agree, 16% disagree. “Stalin was a cruel and inhumane tyrant, guilty of the annihilation of millions of innocent people” – 66% of Russians agree, 20% disagree; 51% of Georgians agree, 26% disagree. 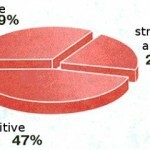 The strong hand theory: “Our people could never cope without a leader of Stalin’s calibre, who would come and restore order” – 30% of Russians agree, 52% disagree; 29% of Georgians agree, 47% disagree. 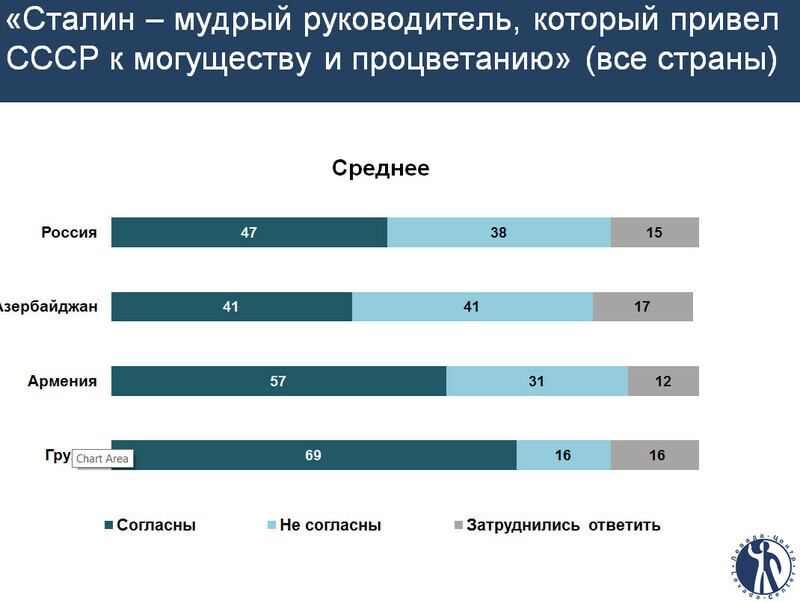 “Would you personally like to live and work under a national leader like Stalin?” – 18% of Russians want to, 67% don’t; 27% of Georgians want to, 60% don’t. “Are the losses sustained by the Soviet peoples under Stalin justified by the great aims and results that were achieved in a short time period?” – 25% of Russians agree, 60% disagree; 28% of Georgians agree, 45% disagree. 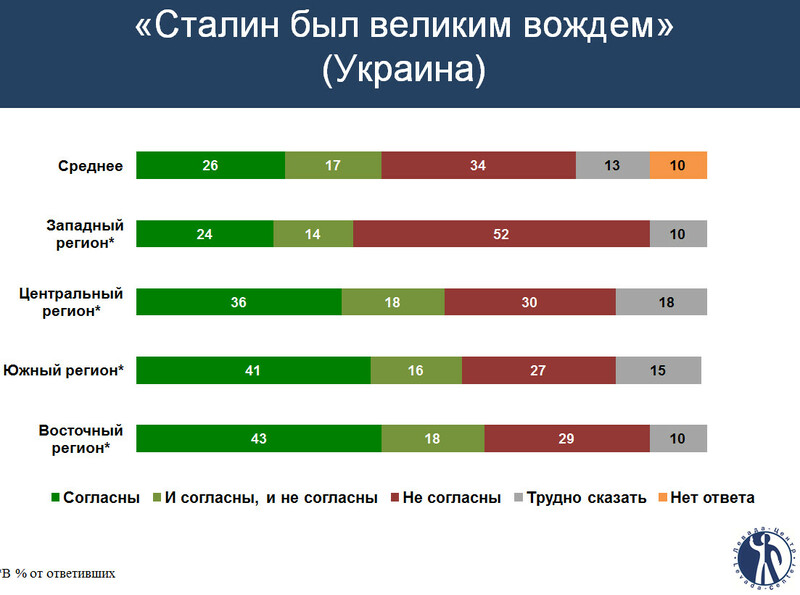 Finally, a poll on how Ukrainians view Stalin: “Stalin was a great leader.” Not directly comparable with the polls in Russia and the Caucasus countries, but still, if you believe that Stalin was unequivocal ruin and evil, you are unlikely to say that he was a “great leader”; at the least, a positive answer implies some level of ambiguity. And as we can see a majority of Ukrainians in the east and south view him positively. Even from those from the center, who suffered most from the collectivization famines, more say he was a great leader than not. The only part of the country which definitely says he was not a “great leader” is the far west but of course it too has its own historical cockroaches. 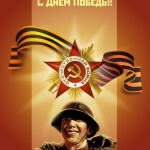 Of course I have to stress that I don’t condemn Georgians for loving Stalin; the aim of this post is just to clear up some misconceptions that idiot Westerners have about how Russian Stalinophilia is somehow “exceptional” in the post-Soviet context and worthy of endless harping in the media. If I was a Georgian I too would probably love a countryman who administratively expanded the borders of Sakartvelo and subjugated those one hundred million Russkies up north under his heel. But it does also show the hilarious hypocrisy of Saakashvili who used to rant on about how Georgians are inherently more democratic-minded and historically responsible than Russians.